Penny Saunders’ ‘Restless Temple’ is a sculpture designed to be in constant motion. 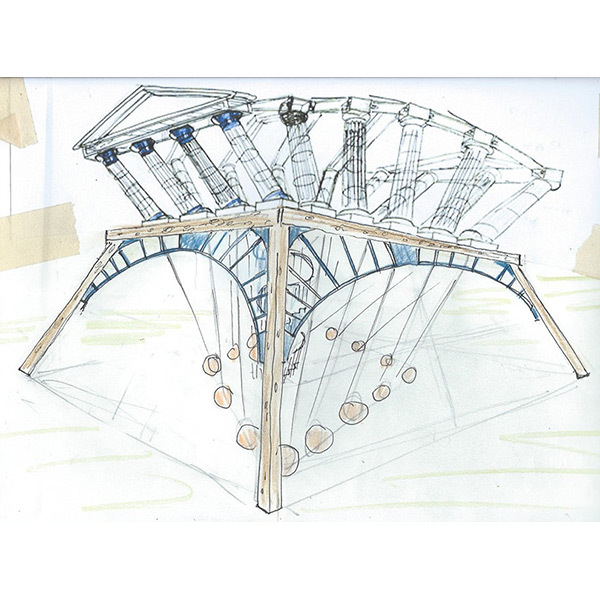 Made up of fourteen hollow cedar columns with cores of tensioned steel, counterweighted by concrete weights and connected by an articulated framework, Restless Temple has been in development for almost fifteen years. In Saunders’ own words, Restless is about ‘flexibility in the face of the mighty forces of Nature’, and sways freely in winds of up to 60mph. 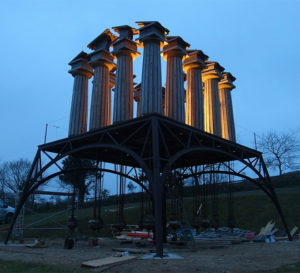 Rather than treating Restless Temple as a ‘building’ and using traditional uplighting on the exterior of the columns, Penny requested that I light the inner space of Restless, to create a sense of depth within the interior. 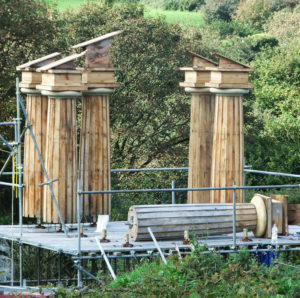 Given its position at the top of a windy hill at Tremenheere Sculpture Gardens, it was also vital that the lighting was able to withstand the elements. I designed a scheme that lit both the Temple and the mechanism beneath it using 17 watt, 3,000K LED spotlights with a 45 degree beam angle. In the upper section, four spotlights were angled to throw warm white light across the space, which creates a diffused glow within the structure. 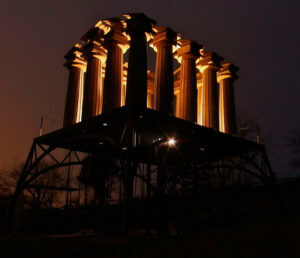 The lower section is lit by a spotlight at each corner, each of which is dimmed to 50%, so the mechanism is visible in the dark but does not draw attention away from the sculpture itself. The system is timed to come on at dusk, and remain on until 11pm. The spotlights used in the installation are rated IP66, and are therefore well suited for the ever-changing Cornish weather.